I have had a few cars where I have not been able to drive for months because of surgery, medication or both. They have all been good though, started and run well the first time they were turned over again. This car has had a slightly different story. Let me start by a medication update. I managed to come off of the OxyNorm and switched my OxyContin for Tramadol without advice from my GP. During a telephone consultation I explained what I had done, the plan now is to come off the Tramadol first then work on reducing the Gabapentin. I asked if I would be able to drive now and was told that I should be OK now with the medication I was on. Obviously if I felt tired or drowsy not too but that goes without saying. My first trip was a short one to the vet with Cody. When I started the car a warning came up to say there was an ‘Engine Fault Repair Needed’. I’d had a letter from the car dealer to say that it was due for an Interim Service and would phone them soon to get it booked in. I took Cody to the vets again and the same warning appeared, we had a full couple of weeks so I would book the car in soon. I also had a break fluid warning and something about the possibility of blocking filters???? The day to phone the garage arrived and I went out to check the mileage, as I was sure they would ask. I put the key in the ignition and turned it to get the mileage and the whole dashboard lit up like a Christmas tree. I tried to start it and then I got the usual warning, a gearbox warning, parking brake failure (electronic parking brake) and it was bragging that it had gone in to economy mode. So bloody economic it wouldn’t even start and I couldn’t even release the parking brake! The original plan for the service was I would drive it there for 10:00, someone would bring me home and then collect me again when the car was ready. Yesterday I phone the garage with an update to say that the faults had cleared but for my peace of mind and the fact they wanted to check it over we decided to go ahead with the plan. I just happened to mention that I would be in a wheelchair and suddenly the guy had to have a word with his driver. In the end it was decided that the driver would collect my car and bring it back for me, which was a result in my book. Just after 10:00 the man arrived to take my car to the dealers to be checked over. He told me that hopefully the car would be back today, if not tomorrow, but they would keep me updated with progress. 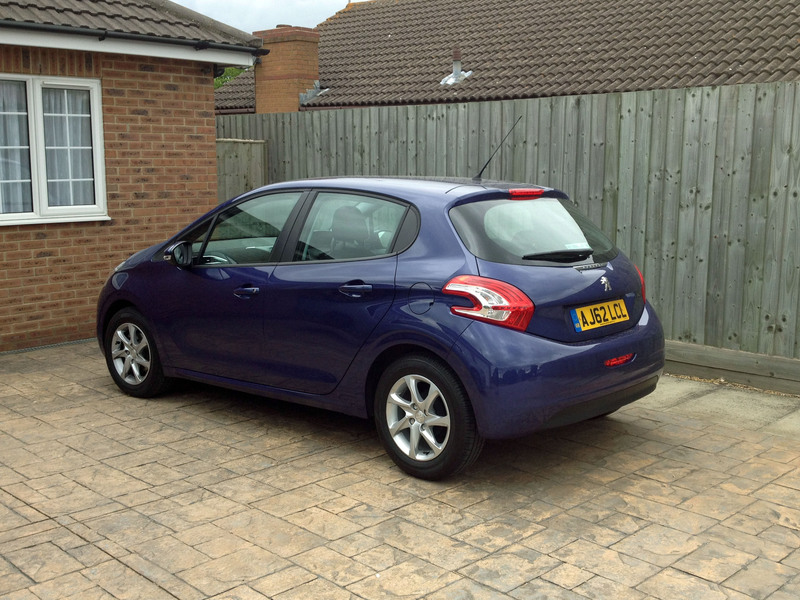 So now there is a solitary little new blue Peugeot 208 sitting where my car should be. Hope there’s nothing majorly wrong with my car and it’s only a battery problem. It’s great having all the electrical gadgets but not when there is a battery issue, as in this case.